What does competitive climbing look like? Something like this. A. Imma let you finish, but no, competition climbing isn’t usually about who can get to the top of the wall fastest. If you ask that question, you might see a competitive climber’s face twitch a little. It is the most logical interpretation of the word “competition,” I guess, but even though speed climbing is a division of competitive climbing, it’s not the main focus – or the most exciting. Competitive climbing is usually about difficulty. A route or boulder problem will be worth a certain number of points based on how difficult it is. The harder the climb, the more points you can earn for successfully climbing to the top without falling or resting on the rope. 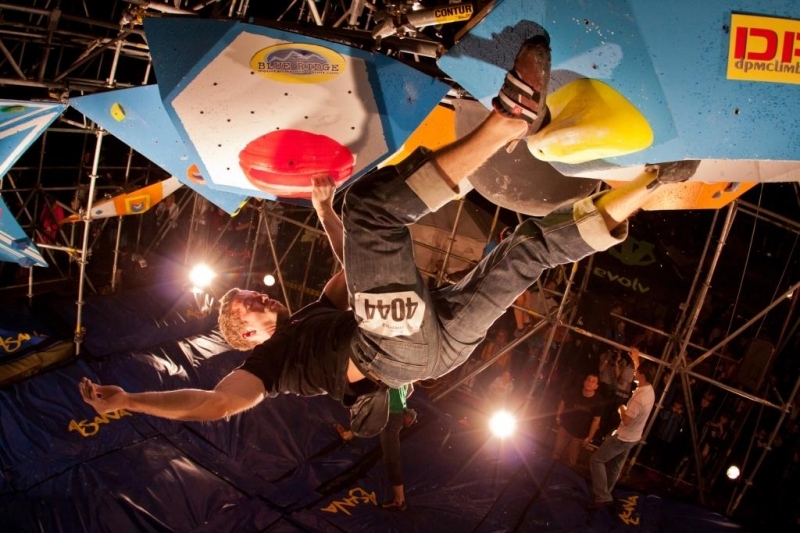 Outdoor competitions like the Triple Crown Bouldering Series use standard grades for the problems and assign the points accordingly. If you finish the problem (which usually involves standing on top of the boulder), you get the points. Fall before the top, and you don’t. “Indoor” competitions, such as the ones sponsored by USA Climbing or the Boulder Bash at Dominion RiverRock aren’t always inside, but they are always on synthetic rock. This gives the routesetters the opportunity to truly test the athletic limits of the climbers who will be competing. Routesetters – particularly the ones who set for competitions – are highly trained in the fine art of bolting plastic to plywood. A skilled setter can envision a move, and then set the holds just so to force the climbers to do exactly what the setter wants. Sometimes these moves focus on power and endurance; others focus on creativity and route-reading. All of them push the climbers both mentally and physically. USA Climbing is the governing body of competitive climbing in the USA. Although rope climbing was short-listed for inclusion in the 2020 Olympics, the International Olympic Committee decided that climbing wasn’t quite ready for the Olympic stage. Despite this, there are still competitions for all ages and levels all over the world, from citizens’ comps at your local gym to World Cup events that features the best athletes from all over the world. This entry was posted in Competition, Indoor Climbing, OAQ and tagged competition, OAQ. Bookmark the permalink.